Sri Lanka was our first choice of destination for our honeymoon three years ago. I had visited the island country earlier on work and had fallen in love with the peace in the country. I was keen to come back on a holiday soon. However, circumstances got difficult back then and we couldn't plan an international travel for our honeymoon. But we were able to fulfill our dream for our third anniversary in March this year. We began the planning from January. Our first step was to book the tickets so that we can get the main task off the list. No matter at what time we checked, all the International Airlines that flew from Bangalore to Colombo were really expensive. We then decided to change our starting point. The International Flights from Chennai to Colombo were much cheaper than the ones from Bangalore. We saved close to Rs. 15,000 just by booking our flights from Chennai instead of Bangalore. The return journey was directly from Colombo to Bangalore. Chennai is just a six hour journey via train from Bangalore. We booked the Chennai Express and now our travel was sorted. Next, it was time to plan an itinerary. We sought help from some local agents who put us in touch with a travel company in Colombo. Many plans were drawn up and it took quite a number of revisions before we could settle on an itinerary that suited us very well. It did include a quite a bit of travel within the country, but we didn't mind. With the tickets and itinerary sorted, we relaxed. Soon, it was time to pack and get set to leave. The train from Bangalore to Chennai left at around 8 am and we were in Chennai by 2.30 pm. After exploring the local places and converting some cash into Lankan rupees, we got some good rest before starting our first international trip together. It took us an hour and ten minutes to get to Colombo from Chennai. 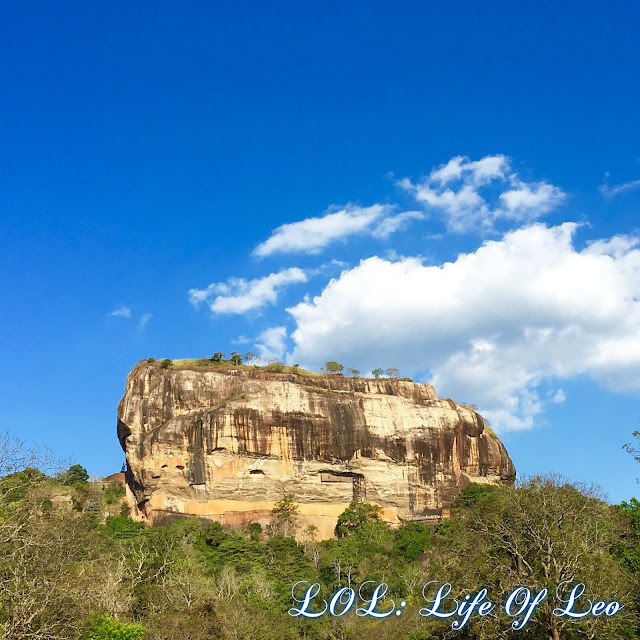 Mihin Lanka was the flight we chose for our onward journey and it was a pleasant experience. We were met by our tour guide at the arrival and the first thing we wanted to do was to get a local sim card. I have paid close to half a lakh of phone bill once thanks to an international travel and I didn't want to risk it again. A local sim was bought with enough currency in it to last us for a week. The only calls we would make was to the guide as well as our parents back home. Since we reached Colombo before noon, our vacation started on the same day. This is how we explored Sri Lanka on our third year wedding anniversary. After getting a couple of hours of rest, we freshened up and began our holiday. Since we had only half a day in Colombo, we went in for a city tour. The first place we visited was the Independence Square Arcade and the shopping mall. The arcade was so neatly maintained that it surprised us. Not a speck of dust any place. The place was beautiful with strong pillars and neat marble flooring. The shopping mall was so unlike the malls we see in India. This looked like a palace or a beautiful church. There was so much of greenery around it and beautiful flowers and pristine clear fountains. We spent a good amount of time walking around here and basking in the beauty. The next stop was to ODEL, Colombo's number one shopping destination. We did not shop for anything here as everything was ridiculously expensive and most importantly everything was available back in India too! But we did have some ridiculously expensive gelato though. After a light dinner, we were back at the hotel for a good night's sleep. Bentota is a three hour drive from Colombo, so we started early after breakfast. The roads are so clean and wide that the journey did not seem tiring at all. We enjoyed the cool breeze and even though the sun shone way too bright at times, it was not troublesome. We stopped by the Kosgoda turtle hatchery where a group of people were working on the conservation of the turtles. These people pay the fishermen to get them turtle eggs from the beach and bury them in sand for sixty to seventy days until they hatch. They are then released to small ponds where they learn to survive initially. After 21 days they are then released into the ocean. Out of a 1000 turtle babies released to the ocean, only one manages to survive, they say. After visiting the turtle hatchery, we had the rest of the day free where we decided to explore the hotel and it's beach. After a great dinner, we dozed off instantly. The Gorgeous Mirissa Bay - Look at the color of the sky reflecting on the water! Anniversary Day! It had to be special. Mirissa Bay in Sri Lanka is famous for it's whales and dolphins. Although this was not included in our itinerary, we decided to explore it as it was a once in a lifetime opportunity. We paid an exorbitant amount for this, but we knew it would be worth it. We left early at around 4 am to get to Mirissa by 6.30 am where a boat was waiting for us. We were here for the whale watching, where they would take us hundreds of kilometers in to the ocean and we could spot dolphins, whales and other sea creatures. We were given life jackets and after taking medications for sea sickness, the boat of close to 120 people left. Soon we were in the middle of ocean surrounded by nothing else but water. We spotted quite a lot of dolphins but sadly we couldn't spot a whale. We did see wonderfully colored turtles though. We spent seven hours in the sea and it was such a magical experience! The Colonial Buildings - Pretty As A Picture! On our way back to Bentota, we visited Galle. Galle is filled with colonial buildings and it is quite a pretty sight to the eye. We visited the clock tower and the stadium after a quick lunch and explored the city a bit. The weather was slightly hot and we saw the most beautiful beach ever. The water was clear blue and the sky reflected so beautifully on it! Tired from waking up in the wee hours of the morning, we drove back to Bentota and hit the bed straight. Pinnawala - How Peaceful They Look! The elephant orphanage of Pinnawala always stood out in every itinerary we received. We left around 9 am and this place was not too far away from Bentota. The elephants are left free here and the young ones are a treat to watch. They play with each other and just enjoy themselves. The violent ones are tied to be tamed. Sadly, the whole thing is now commercialized and the mahouts charge you to touch the elephants, feed them or to just take a picture with them. Although free, the animals were never free. We visited a tea factory on our way to Kandy where we were shown how the tea leaves turn into tea powder. We even received a complimentary cup of hot tea that was surprisingly refreshing in the scorching heat. We reached Kandy in a couple of hours and after a really good lunch of pure vegetarian South Indian food, we headed towards the Buddha Tooth Relic Temple. When Buddha died and his body was being burnt, his tooth fell off the funeral pyre. A devotee picked it up and decided to set up a shrine for it. Over the years it passed many hands and finally ended up here. Once a week the tooth is put out to display for the devotees, but sadly the day we went was not that day. The temple was however really beautiful and very well maintained. The sun soon set and we were then taken to our hotel in Kandy. Buddhism is a religion that has always fascinated me. If I did believe in religion, I would be more than happy to follow this one. 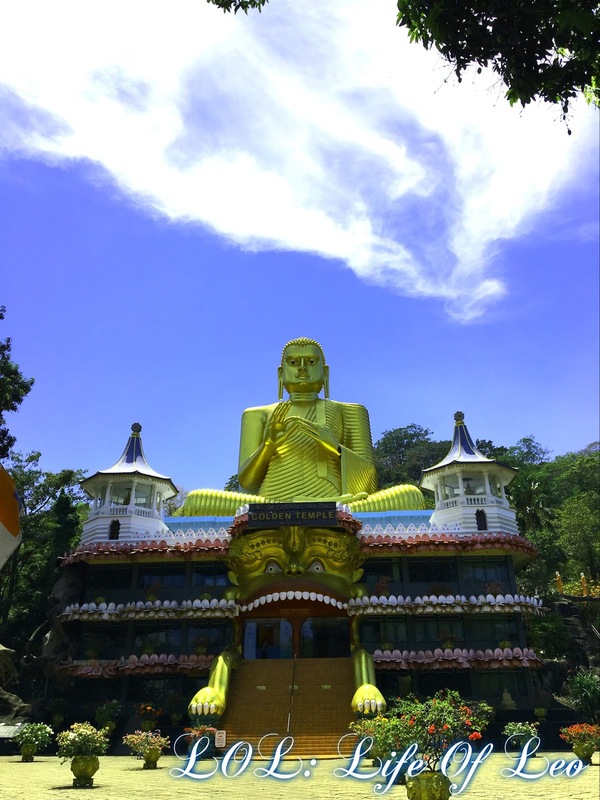 Right from the beginning of our vacation, I was excited to visit the Golden Temple at Dambulla. We left from Kandy early and in a few hours were at Dambulla. A tall golden statue of Buddha greeted us and we were told to walk up the caves behind and explore the place. After a certain point you are not allowed to wear footwear and the scorching heat made it impossible for us to walk. With great difficulty we managed to get to the caves and it made me realize that the trouble was so worth it. There were thousands of Buddha statues all over the place. Most of them really alike and yet very different. There was something so peaceful about this place that I never wanted to leave it. The roof of the caves were hand painted in different patterns and the color was still intact from centuries ago. It was such a treat to the eye! 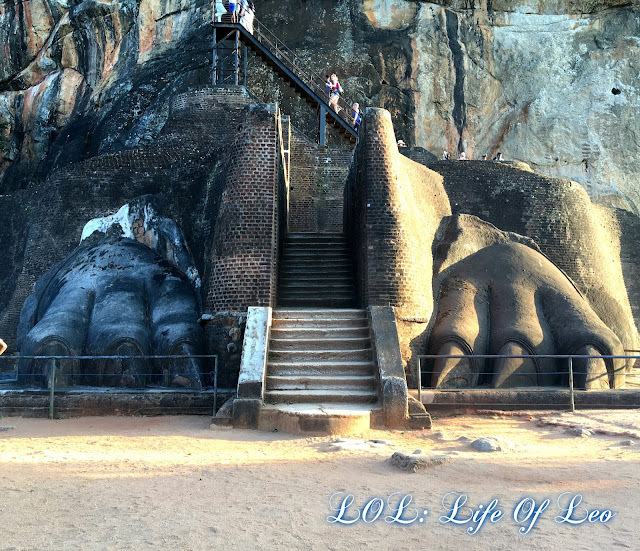 Lion's Rock - Sigiriya. We Had To Trek Up This! After lunch, we left for Sigiriya. Lion's Rock is the main attraction of Sigiriya. It is a really huge rock/mountain that needs to be climbed up, almost like a trek. On top there is a huge Lion carved out of stone whose face is now destroyed, but you do get to see the majestic arms. The climb was really hard and the heat was not helping either. It took us a couple of hours to get to the top, but the view from there was gorgeous! Green and blue and nothing else in between. It finally felt like the point where the sky and the earth meets. After basking in the view for a while, we headed back down. Coming down was easier and we came down in half and hour. We were drenched in sweat and our clothes and shoes were completely muddy. We got to the hotel and took a nice shower before hitting the bed. Our vacation had come to an end and it was now time to check out. After a hearty breakfast we left the hotel and were en route Colombo from where our flight was. 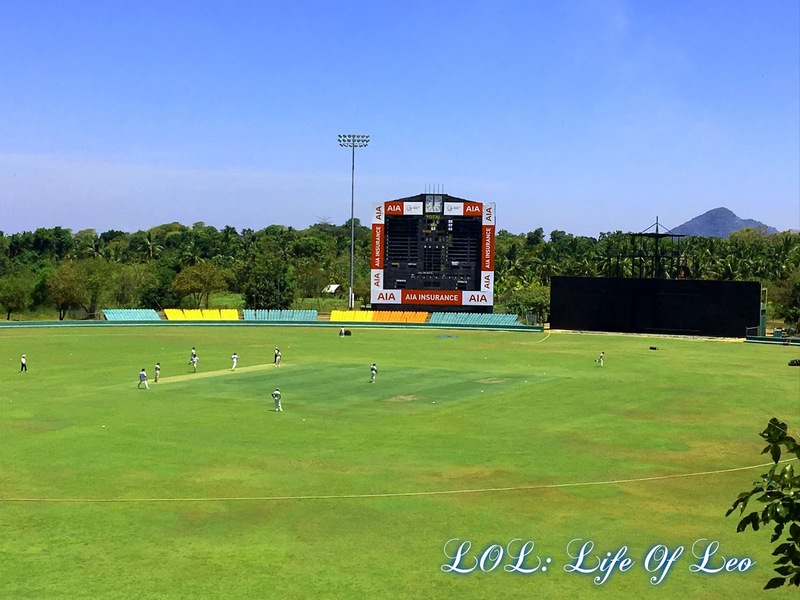 We stopped by the Dambulla Cricket Stadium on the way and bribed the officials to go take a look inside. There was a local match going on and it was a delight to watch it. We reached Colombo a couple of hours before our flight and checked in. Srilankan Airlines was our choice for the return flight. The journey was pleasant and hassle free. While we were up in the air we thought about the wonderful trip we had had and what a great experience it had been. We reached Bangalore by late evening. We were exhausted, but we did have a bright smile on our face. Whew... that was a wonderful holiday. I would love to visit Sri Lanka someday too. I remember watching a hindi film shot there abd was amazed at the greenery.also, it's so accessible. Sri Lanka looks so beautiful ... it must have been such a lovely vacation!! Loved the Relic Temple. What a lovely trip! I've never visited Sri Lanka but it is on my wishlist. Who knows, maybe this year! The photos are gorgeous! You should visit it as soon as you can my dear. Beautiful pictures! And I know how hard it is to write trip reports - you did a good job!